Stratton Mountain in southern Vermont is just a few hours from Connecticut, It has 99 trails and is known for its grooming and snowmaking. Stratton Mountain in southern Vermont is just a few hours from Connecticut, It has 99 trails and is known for its grooming and snowmaking. With skiing and snowboarding, it’s important to get your runs in. But for the rest of us, things, like life … work, family commitments, kids, spouses and significant others … sometimes get in the way of playing on the mountain. And often by the end of the season, they only went a handful of days. If any. LOCATION: Near Bondville, Vermont off Route 30. TRAIL TYPE: Novice 40 percent, intermediate 35 percent, advanced 16 percent and expert 9 percent. SUMMIT ELEVATION: 3,875 feet, the highest peak in southern Vermont. LIFTS: 11 including six- passenger chairlifts; four, four-passenger chairlifts; three, three-passenger chairlifts: one, two passenger lifts, one gondola and one magic carpet. For me, if I’m not skiing at least once a week during the prime season I’m not satisfied. I try to temporarily satisfy that alpine craving on Connecticut’s local hills or Massachusetts’ mid-sized mountains. I ski at night, midweek, after work and often just for a few hours. Sure, the trails aren’t as long or steep as the ones farther north, but I’m out there ... living the dream. Still the bigger mountains with longer, more challenging trails and beautiful mountain vistas are, like a compass, pointing me north. One of the benefits of being a Connecticut “flatlander” is the fact that there’s some good Big Mountain skiing and snowboarding in mid-New England and New York’s Catskills just a few hours away. On a side note, if a Vermonter calls you a “flatlander,” remind them of this: Ethan Allen of the Green Mountain Boys was born in Litchfield and when Vermont was a republic it was called “New Connecticut.” And finally, two of the biggest ski resorts in Vermont - Killington and Mount Snow - were started by Connecticut Yankees. The best day trips to these “close” Big Mountain areas should be no more than a three and a half-hour drive, have a vertical drop of at least 2,000 feet and lots of trails that have a good mix of intermediate and expert trails. Since it’s a day trip, you don’t need lodging or any of the off-slope amenities resorts offer. In under three hours (one way) from my home, Stratton Mountain in Vermont is a perfect destination. I went there last Friday with the simple intention to have a laid-back day ski day without the stress of weekend crowds and Connecticut traffic jams. I wasn’t going to count the runs I’ve made during the day. I’ll adopt the Euro attitude and just enjoy the day and the people on the mountain. When I first arrived at Stratton, I was met by two older women wearing the red Stratton jackets and knit hats. They smiled and said the conditions were great, especially in the morning after manicured grooming. Stratton has had this no boot or gear bags in the lodge for years. All politely enforced by the bag ladies that frees up seats and tables for Stratton’s guests. The resort’s food goes to another level at The Market in the main base lodge. Besides burgers, offerings are soups and chili, turkey pot pie, salads and bowls of noodles and rice. All food is served on real plates and in enamel bowls. No plastic utensils here; real metal silverware. I went for the New England clam chowder for less that 10 bucks that was generous in size and clams. And when you’re finished eating, someone comes around and ask you if you’re done. With moments, the dishes and tray are gone. Stratton’s attention to detail continues on the mountain. When I was there last Friday 76 of its 78 open trails were groomed to a corduroy packed powder. Any slope that had a mogul field, had a wide and groomed escape path along the side. I chose the lift to mid-mountain for my first runs of the day. The lift is called the American Express; that’s right after the credit card. Unlike some resorts, Stratton still has lefties that scan a lift tickets. Under the lift are easy intermediate trails with gentle names like Tink’s Link, Beeline and Suntanner. After skiing a few runs, I realized why it’s wise to warm up on some easy trails. Usually, I get the first ride to the summit. When I finally made it to the 3,875-foot summit via the Snow Bowl lift, there was a light fog that allowed for decent visibility. The surface was a little harder than the base, but still good packed powder for turning. I headed down the double-black Upper Spruce trail. The trail started off slow, but quickly gained lots of pitch heading down. There were a few hard snow spots (aka ice), but those could be easily avoided by just looking forward for the spots that had good snow. Critics say the trails are too groomed, the terrain too easy, too crowded and with far away parking lots. Its collection of shops in a Bavarian-styled village (with clocktower), has also been called too commercial. Yet, those things the purists scoff at are what many people love and a full list of winter events Stratton offers like moonlight snowshoe hikes, romantic dinners and even a walk with your dog at the summit. Lots of people like because of its groomed trails. It’s an easy drive drove Connecticut. Drive up I-91, take Exit 2 in Brattleboro and travel north on Route 30 for about 40 minutes. It’s a very Vermonty drive with covered bridges, farms, shops selling cheese and maple syrup, village greens and snow-covered mountains. Just be sure to calculate you arrival time before hand. Ideally, you want to be there a little after 8 a.m. to allow time for parking, hauling your gear and booting up. I like to be there when the lifts start turning at 9 a.m. weekdays. Ski to 2 p.m. and head home and beat the worst of the rush hour traffic in Hartford. Stratton is a doable day trip that delivers rewards. While Connecticut got rain, most northern New York and New England picked up a couple feet of snow. 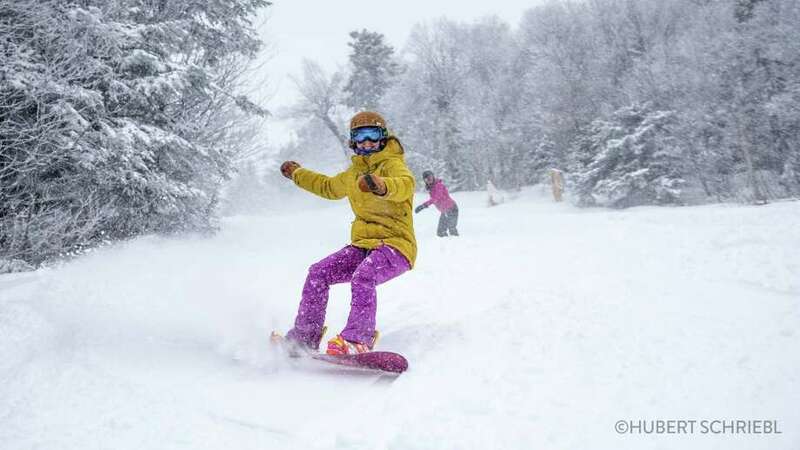 Jay Peak in northern Vermont was the big winner with up to 43 inches of snow in the last week.